Astronomers have used NASA's Hubble Space Telescope to uncover a vast, complex dust structure, about 150 billion miles across, enveloping the young star HR 4796A. A bright, narrow, inner ring of dust is already known to encircle the star and may have been corralled by the gravitational pull of an unseen giant planet. This newly discovered huge structure around the system may have implications for what this yet-unseen planetary system looks like around the 8-million-year-old star, which is in its formative years of planet construction. But the dynamics don't stop there. The puffy outer dust structure is like a donut-shaped inner tube that got hit by a truck. It is much more extended in one direction than in the other and so looks squashed on one side even after accounting for its inclined projection on the sky. This may be due to the motion of the host star plowing through the interstellar medium, like the bow wave from a boat crossing a lake. Or it may be influenced by a tidal tug from the star's red dwarf binary companion (HR 4796B), located at least 54 billion miles from the primary star. "The dust distribution is a telltale sign of how dynamically interactive the inner system containing the ring is," said Glenn Schneider of the University of Arizona, Tucson, who used Hubble's Space Telescope Imaging Spectrograph (STIS) to probe and map the small dust particles in the outer reaches of the HR 4796A system, a survey that only Hubble's sensitivity can accomplish. "We cannot treat exoplanetary debris systems as simply being in isolation. Environmental effects, such as interactions with the interstellar medium and forces due to stellar companions, may have long-term implications for the evolution of such systems. The gross asymmetries of the outer dust field are telling us there are a lot of forces in play (beyond just host-star radiation pressure) that are moving the material around. We've seen effects like this in a few other systems, but here's a case where we see a bunch of things going on at once," Schneider further explained. Though long hypothesized, the first evidence for a debris disk around any star was uncovered in 1983 with NASA's Infrared Astronomical Satellite. Later photographs revealed an edge-on debris disk around the southern star Beta Pictoris. In the late 1990s, Hubble's second-generation instruments, which had the capability of blocking out the glare of a central star, allowed many more disks to be photographed. 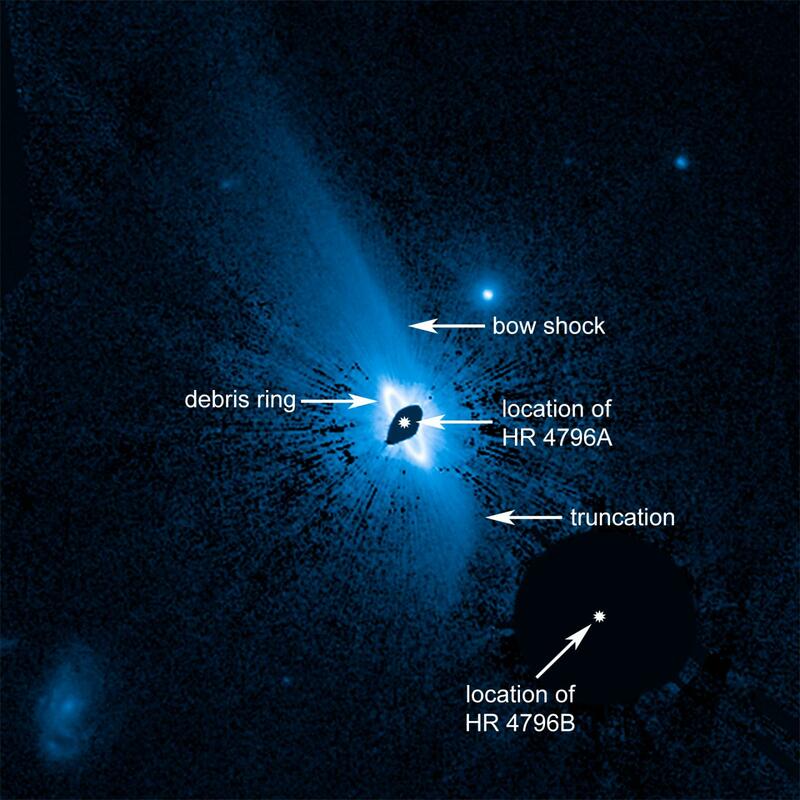 Now, such debris rings are thought to be common around stars. About 40 such systems have been imaged to date, largely by Hubble. Schneider's paper appears in the February 2018 Astronomical Journal.